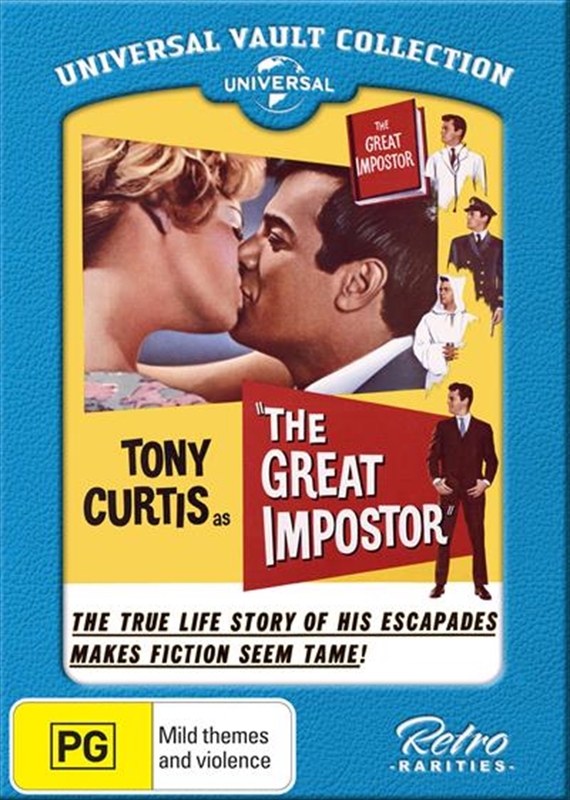 Tony Curtis stars in the incredible but true story of the world's greatest big-time masquerader and charlatan. First shown as a school teacher placed under arrest by state troopers, THE GREAT IMPOSTOR recounts how untrained, uneducated yet brilliant young man Ferdinand Waldo Demara, Jr. assumes the identity of a college professor, Trappist monk, prison warden and surgeon in the Canadian Navy. Whenever his identity is discovered, he shreds it and moves on to another. The unbelievable hide-and-seek story mixes suspense with humor, as Demara attempts to outwit and outrun the FBI, the police, a priest and several girlfriends. The man behind 1950's most amazing headlines was always one step ahead of exposure. Renowned for his eclectic acting range and demanding roles, Tony Curtis shines as the man of a thousand faces in this incredible true story, adding a deft comic touch which makes THE GREAT IMPOSTOR fascinating viewing.